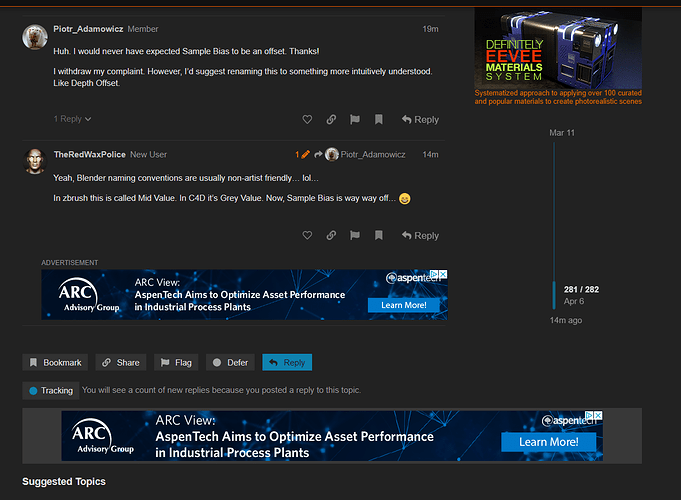 Advertising revenue is essential for the survival of Blender Artists, and it will greatly help us if you allow ads to show. We get it though - ads are usually annoying - especially if you’re not interested in what they offer. That’s why we’re working on our own advertisement solution that will show only 100% relevant Blender products and services. 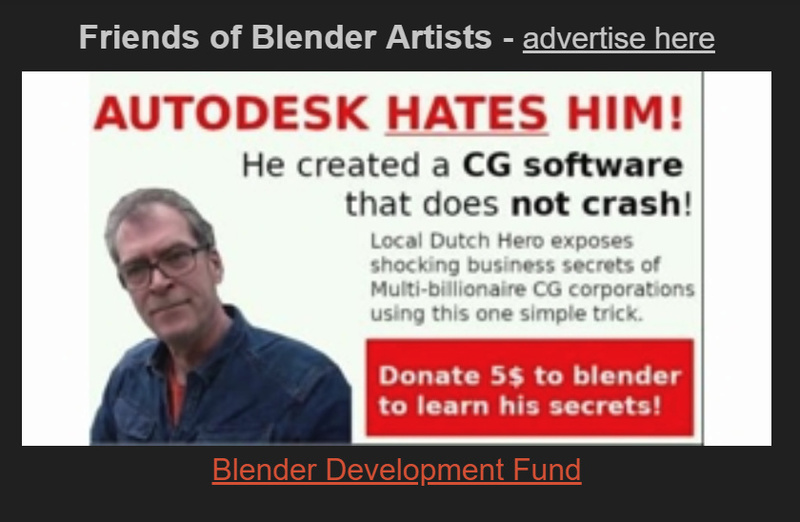 The ‘Friends of Blender Artists’ are our first step in this direction and we’re aiming to replace all Google AdSense ads with out own, relevant, content that’s also 100% free of creepy Google tracking. (Not only here, but on BlenderNation as well). Alternatively, you could support us on Patreon and we’ll remove all ads from the site too. Whitelisted. I’ll click on banners to support BA. Keep up the good work. 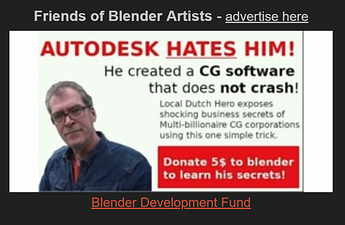 Never just click randomly on banners though - just on stuff that really interests you Google will penalise us if this happens too often and for Blender sellers it doesn’t add value. I’m using uBlock Origin. I have already added blenderartists.org to the whitelist but no ads show up when I’m on the site. Did you reload the page after whitelisting? And which OS do you use? Also: how wide is your browser viewport, in pixels? At smaller sizes the ‘Friends’ block won’t be shown. I reloaded the page but it dosen’t make any difference. My OS is Linux Mint 19.1. I’m not sure how to find out the viewport size in pixels, but if it’s any help my monitor is 23 inch wide and the resolution is 1920 by 1080. I do see the little orange window that says I’m running an ad-blocker. I tested on Opera/OSX and it works ok here. Are you sure you’re not also running Opera’s standard ad blocker at the same time, or another plugin? Don’t you feel this is a bit excessive? I mean, we can talk about the relevancy of adds all day long but do I really need to be presented with three at once? Yes, that’s a bit much, but you also selected an edge case - most of the time you’ll see 2 max. Found the problem. I am running an add-on called Privacy Badger, if I disable it for this site then all the ads appear. I just tried turning everything on and off until something worked. I’ve had this site whitelisted for many years now, because I can be confident none of the ads will try to give me a virus or malware. I use ABP, and whitelisting sites just work. Let us know when this is up and running and i will white-list it, else i keep my block on. Friends of blender artists is not getting blocked by ABP, nicely done. I don’t think it is a problem of being annoyed by ads, at least for me. The matter is: advertisers charge the price they pay increasing the price of products they sell. So, whilst a paid website is paid by its users and they freely choose to do it, a website displaying ads is paid by everyone who buy a product, even if he/she isn’t interested in said website. This is the reason why I will never unblock any ads. Sorry but you call “free” a thing paid by every single person buying an advertised good. If you want to be honest and measure your quality, ask users to directly pay for yourwork. Some will do, some won’t, but you will have a clue on how good you are doing and you will have a site that will be perfect for users and not for advertisers. You DO know we have a Patreon, right? Looking forward to your support there! I sent you one dollar.